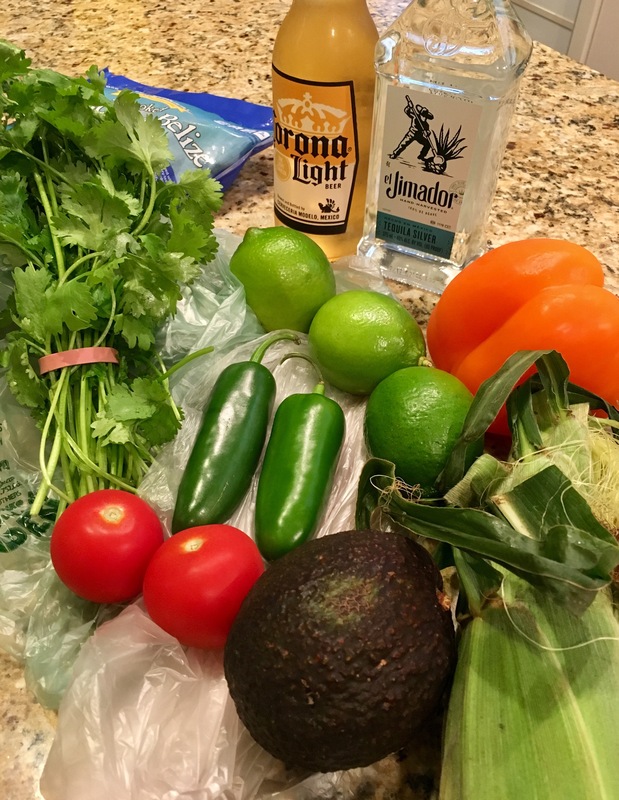 Cinco de Mayo at Home! – Eat, Drink, and Go! What a weekend for great food, over indulging in adult beverages, and having a blast with the hubs. We couldn’t decide what to do Friday night, Cinco de Mayo. Tired from a loooong work week, I knew I didn’t really want to go out and wait for a table, as we didn’t plan ahead for the fiesta. So we decided to make one at home! I even let him into my kitchen to help. 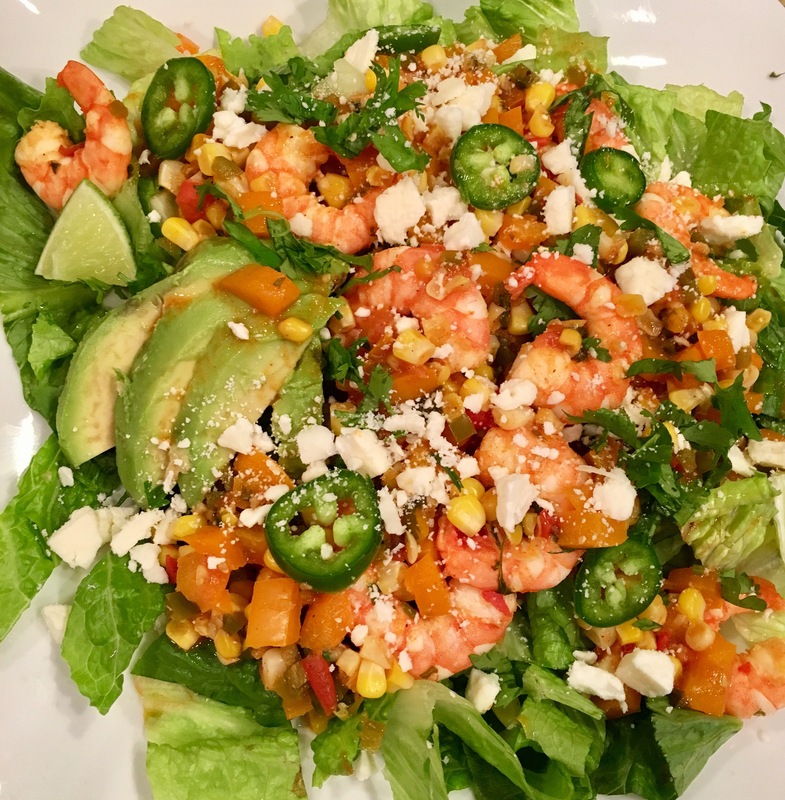 I decided on tequila lime shrimp and just let it flow from there. 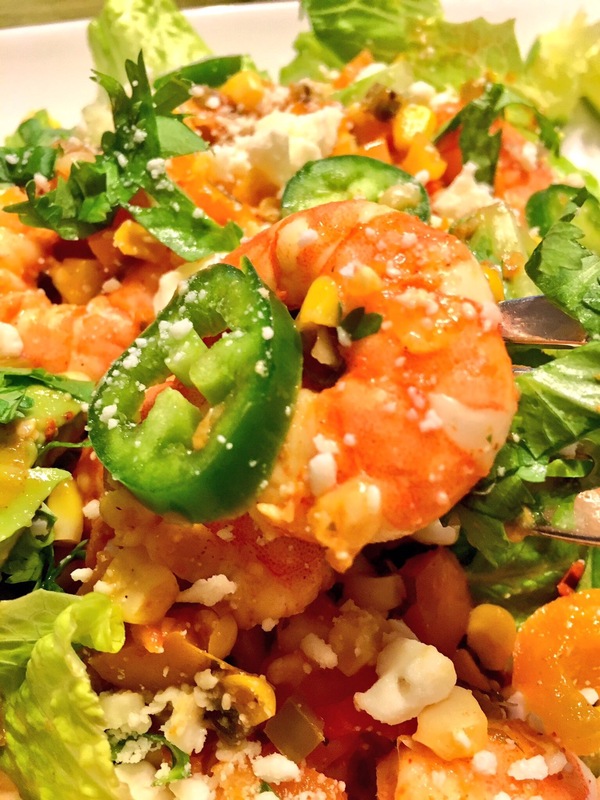 Always start with some good, fresh ingredients. 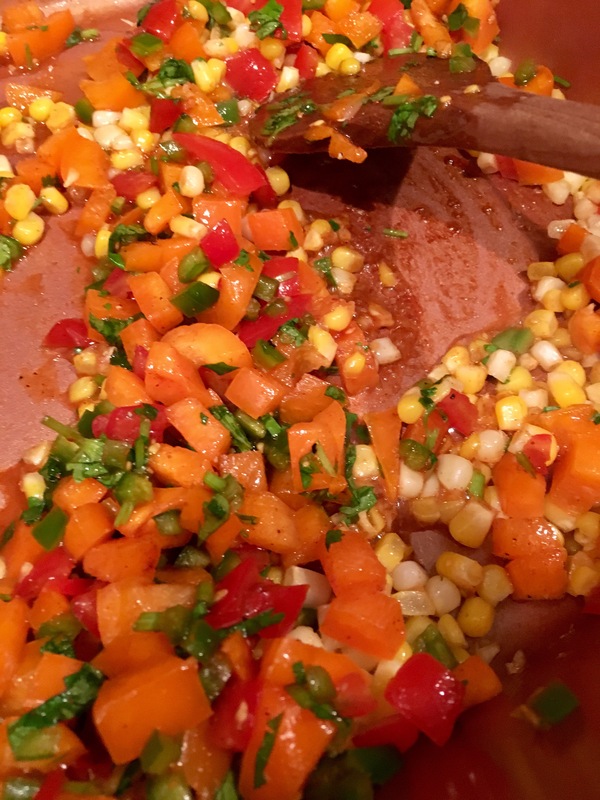 Cilantro is one of my favorite herbs to cook with, and necessary, of course, when I’m making anything Mexican (but I use it for plenty of other things too). 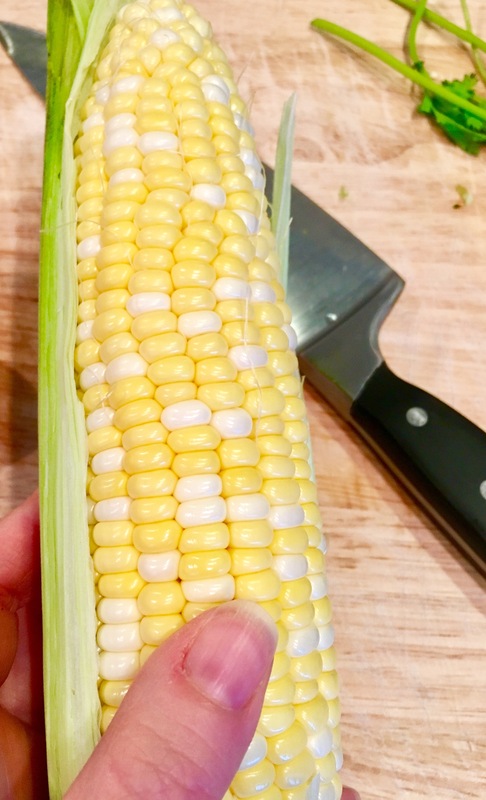 Fresh corn is another fave for way more than Mexican cuisine. 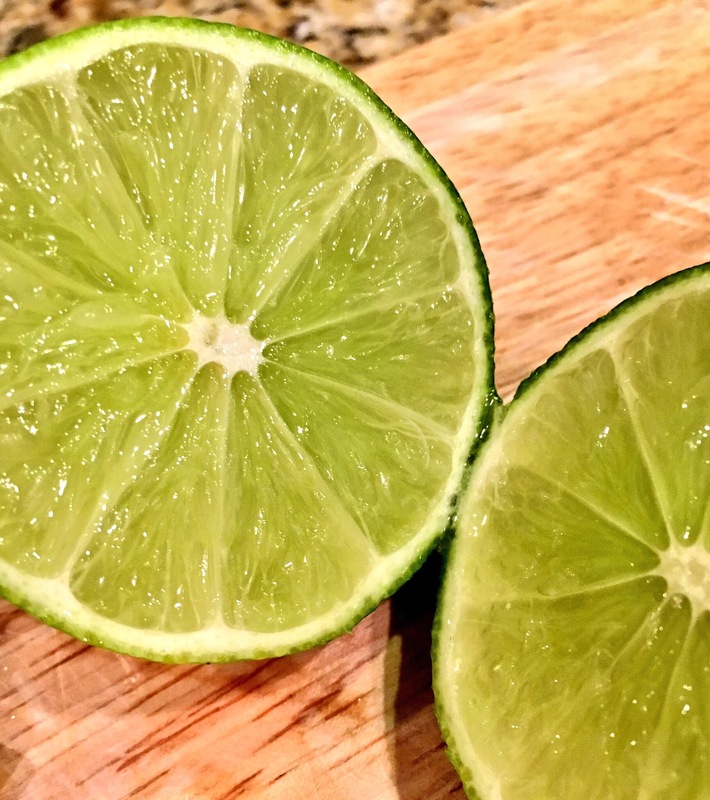 And plenty of lime. 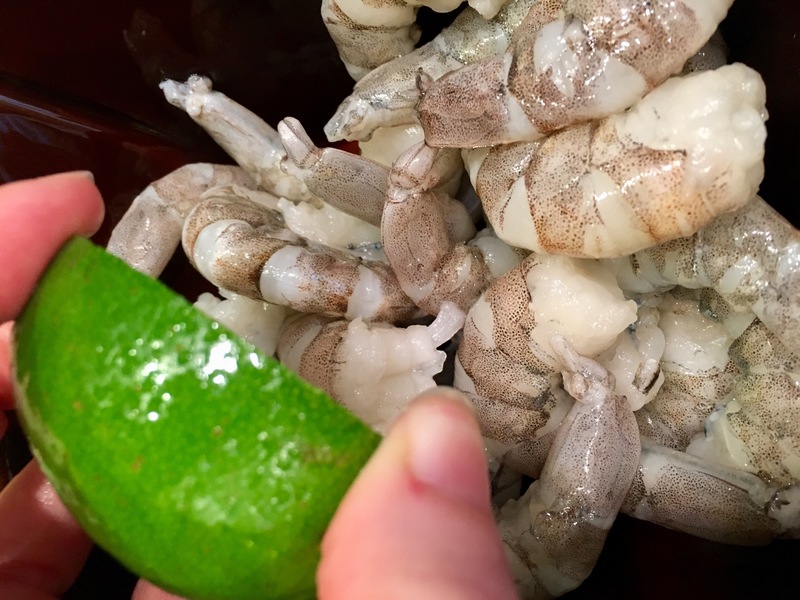 I got the shrimp marinating in lime juice and tequila. 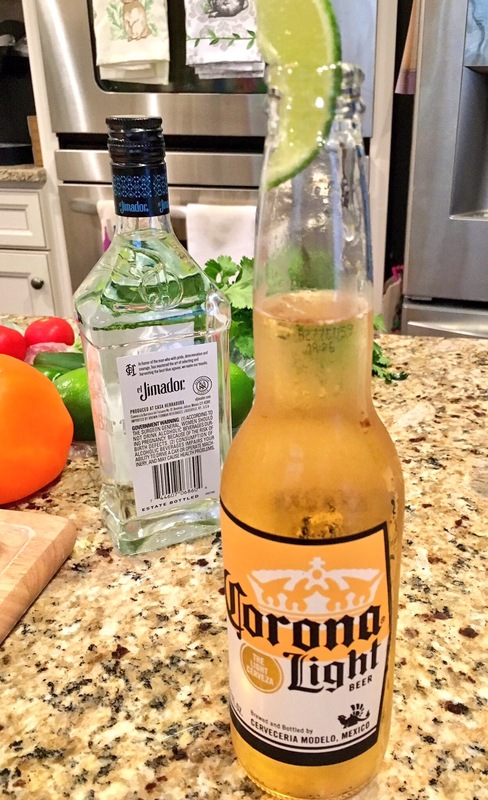 I’m not a fan of drinking tequila (primarily from one really bad experience- isn’t that usually the reason why someone doesn’t do tequila anymore? ), I may have the occasional margarita, but these days I generally just use it for cooking tequila lime things. 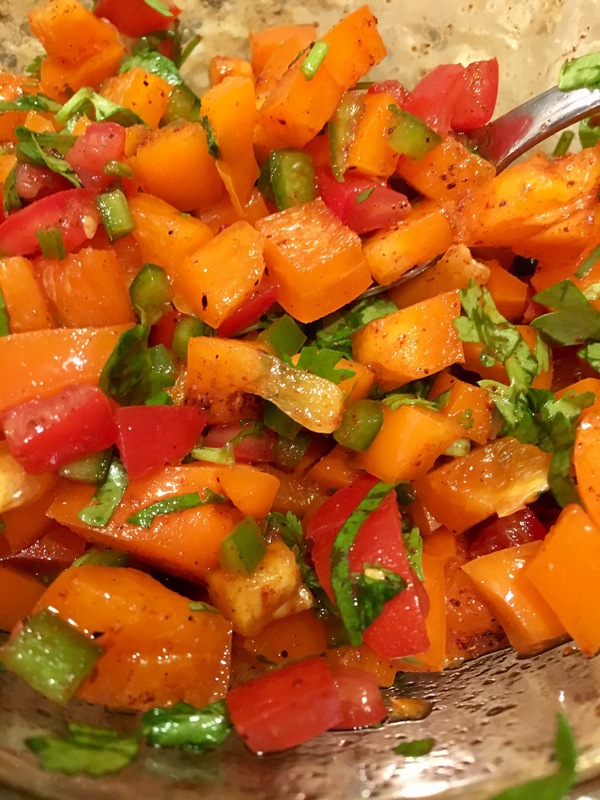 We diced up orange bell peppers, tomatoes, jalapeño peppers, and cilantro for the base veggies. Added fresh lime juice, paprika, salt and pepper and a little chili powder. 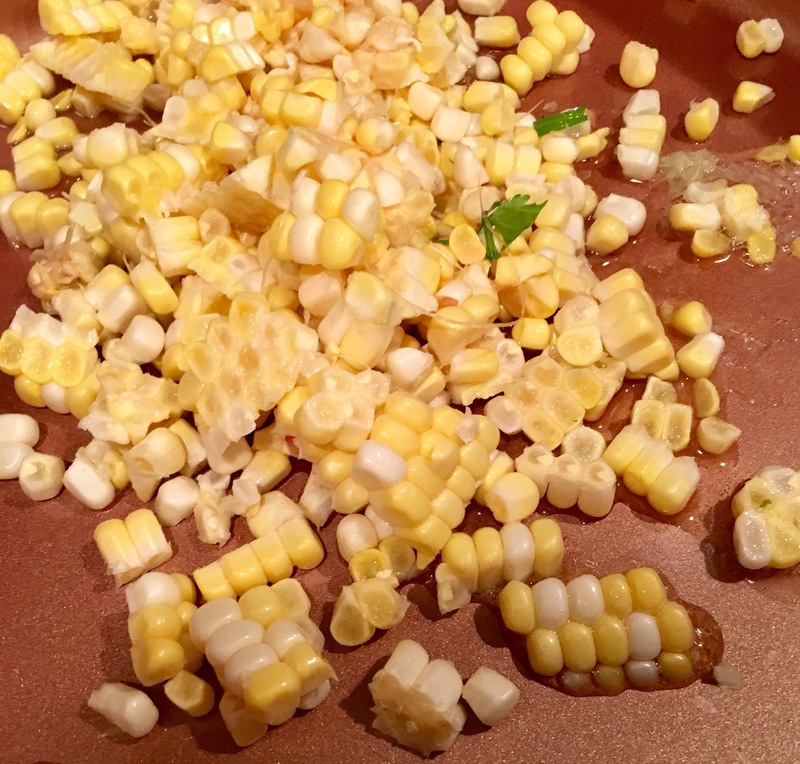 Slice the corn from the cob and get it in a large sautée pan, add in some more lime juice and a little honey. 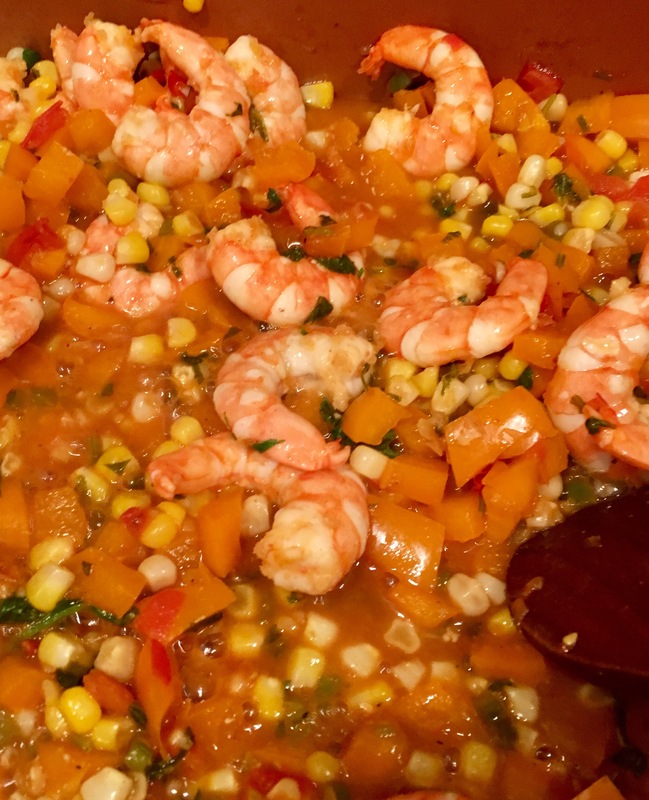 Once the veggies have sautéed, simmered, and sweated out a bit, toss in the shrimp and cover just til the shrimp are cooked. 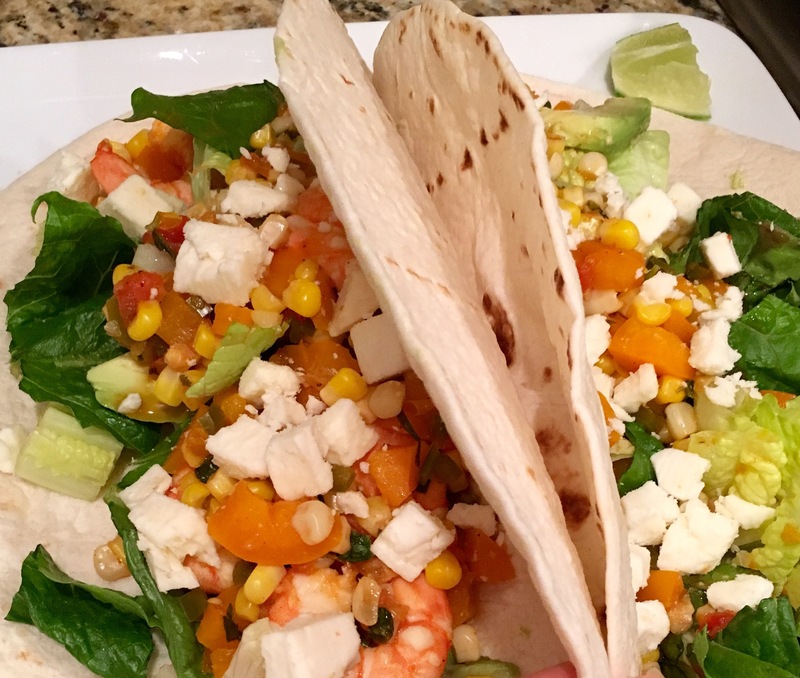 I put all this goodness into tortillas for the hubs, on top of some romaine lettuce and avocado chunks. For me, I just put it on top of a heap of romaine lettuce. 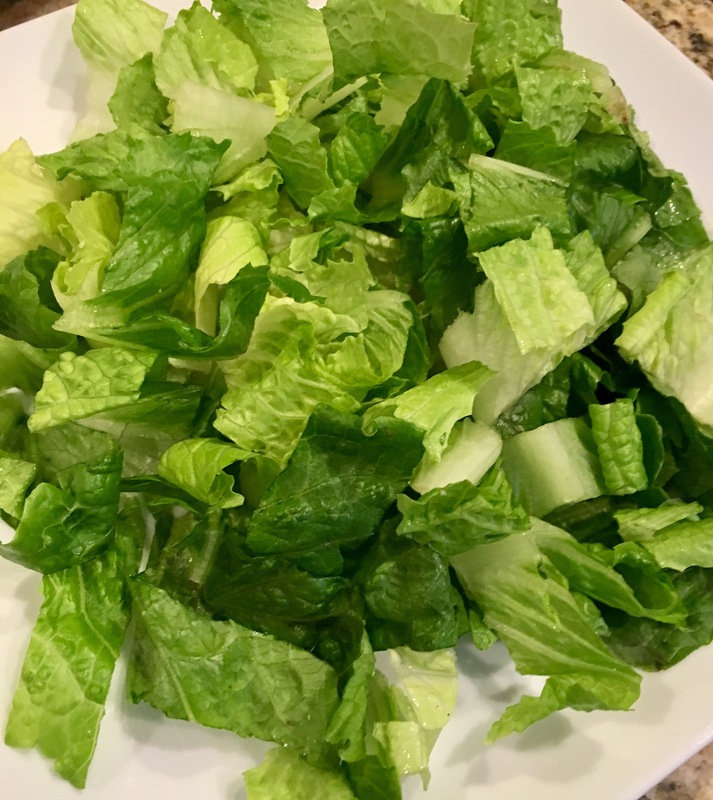 I’m on a romaine kick at the moment. So crispy crunchy sweet. 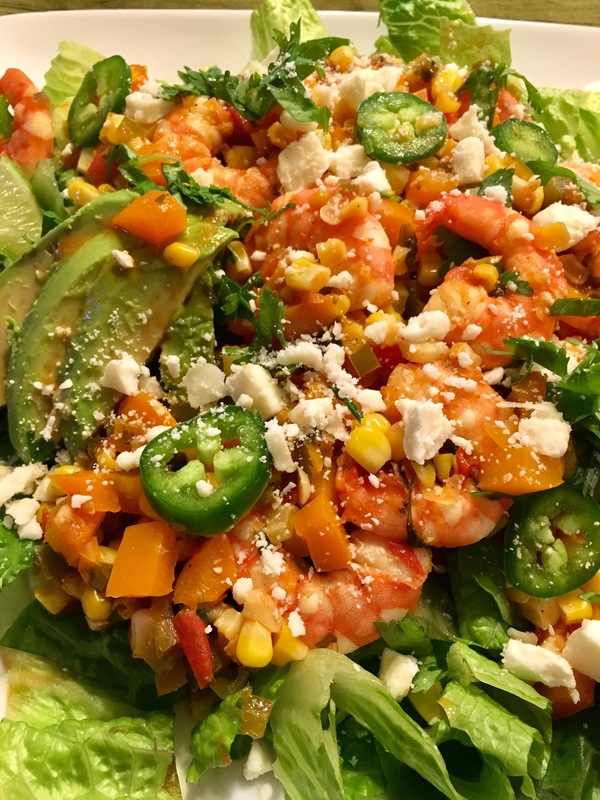 Add in some cotija cheese (feta can sub in if you can’t find cotija). I also put a few slices of fresh jalapeño for a little kick. 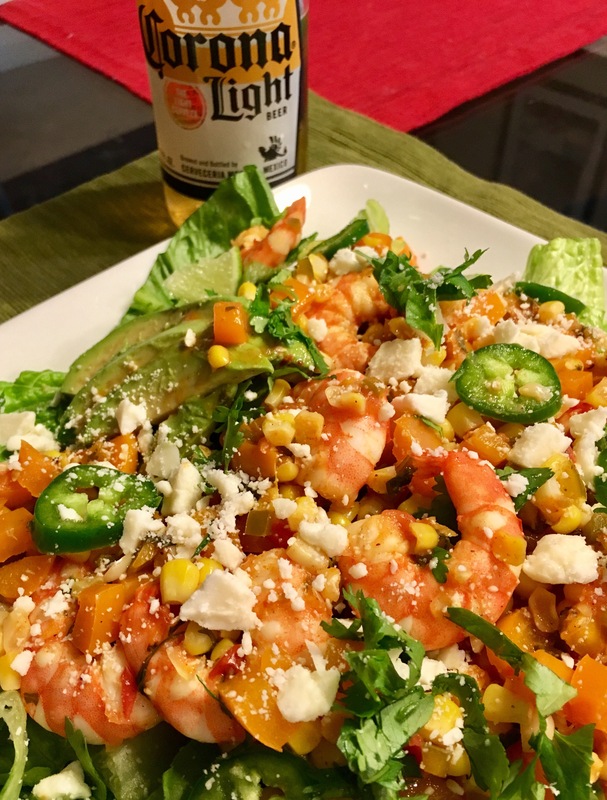 I paired this delicious Mexican dish with a nice cold Corona. Generally, Corona is my go-to beach beer, but to celebrate Cinco de Mayo, I brought the beach to the burbs! So to sum up, I cooked with the tequila and drank the Corona. Ahhh…a perfect bite! 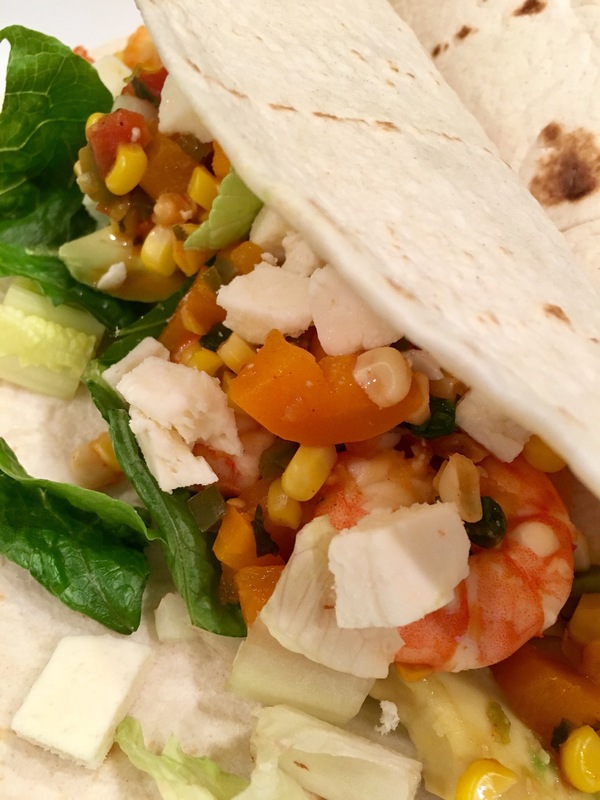 Savory shrimp, sweet corn and romaine, salty cheese, and spicy pepper!! Hope you had a fun Cinco de Mayo! Or at least just a fun weekend! !